There is a journey from text to message. A journey consists of a sequence of locations, so I’d like to lay out the four places of preaching. Perhaps this will be helpful to someone. The first place the preacher needs to go is the study. Just the preacher, the Bible, perhaps a desk, whatever study resources may be available, and a prayerful pursuit of the meaning of the text. What is the goal in this place? To be able to accurately state the main idea of the passage in a single sentence summary as a result of prayerful historical, grammatical, literary study of the passage in its context, with a heart laid bare before God. Who is involved? This place is where the preacher is in prayerful pursuit of the meaning of the passage. So there is a historical focus, a sense in which the preacher is seeking to go back then to the time when the human author wrote the passage. There is a deep concern with making sense of the text as it was intended, as inspired, with the historical and written context, the inspired choice of genre, the content of the passage in terms of its details and its structure or flow, and the intent of the writer. So the preacher is studying, exegeting, interpreting. Yet in that quiet place of wrestling with the text, the text is also wrestling with the preacher. This is not some sort of abstract and entirely objective study. The preacher is there. When the Bible speaks, God speaks, and when God speaks, lives change. So the preacher has the privilege of being marked by the text as the Spirit of God first applies the passage to the life of the preacher. 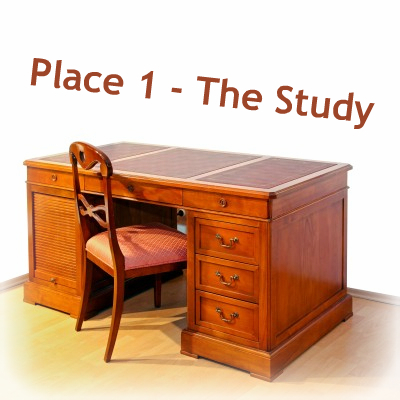 The study is a place of deep fellowship between the preacher and God. Why, then, the study? Should this not be the library, after all, studying involves resources? No, this should be a study, because a library is a place of people pursuing information for a variety of purposes. The preacher’s study is a place where the preacher meets with God as the biblical text is studied both exegetically and profoundly devotionally. Tomorrow, place 2 . . .
← Are We Jesus’ Plus One?